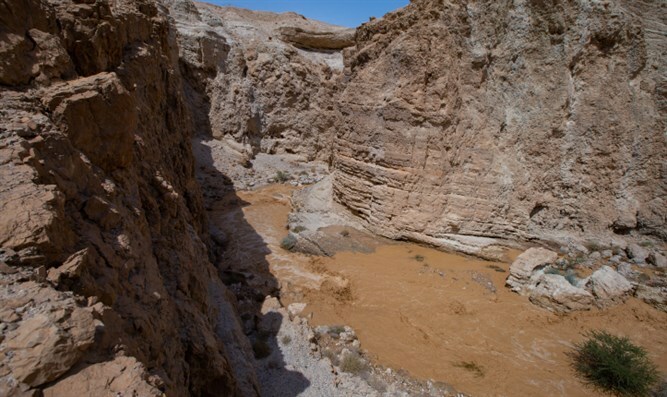 Rain is expected to fall and fill the riverbeds the southern Judean Desert and Arava area. Public warned to stay away. Police are asking the public not to hike in the southern Judean Desert area Friday, due to a danger of flooding. According to the meteorological forecast, a wintry-weather system is about to enter Israel's southern region. This means that rain is expected to fall and fill the riverbeds the southern Judean Desert and Arava area. The Ein Gedi Nature Reserve has been closed off to the public because of the danger of flooding. There is addional danger of flooding near Route 90, between Nahal Tze'elim and Nahal Arugot. In April, flash floods in Nahal Tzafit west of the Dead Sea killed 10 Israeli teens during a hike. In addition, a truck driver died when his truck was swept away by floodwater.